How should our parish communities live out the fullness of our Orthodox Faith by including and making a space for those who need a space in our worship that acknowledges their worth and our need to be a spiritual home for everyone? Fr. 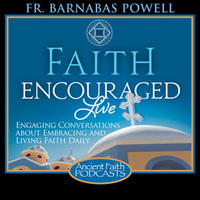 Barnabas talks with Summer Kinard, an author, a singer, and the mother of five autistic children. Then be sure to listen for a very special announcement from Fr. Barnabas in the second half of the show. Fr. Panayiotis Papageorgiou rejoins Fr. Barnabas for tonight's topic. What is the history and theology of Islam, and how does the Orthodox Christian faith compare?